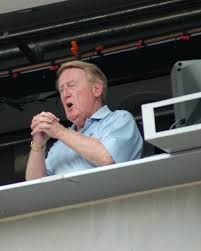 Join me here this baseball season to follow and celebrate Vin Scully's final summer as Dodgers announcer. Red Barber remembers Jackie Robinson and the turmoil around his breaking the baseball color line. Kevin Bender will present a free screening of Ball Talk on Sat June 13 at the Carlsbad City Library. Kershaw was perfect, but Ramirez wasn't. Vin, as usual, did a fantastic job. Why not listen to Vin? Still don't have the Dodgers on TV. But I like listening to Vin on the radio anyway. Vin Scully and the Dodgers team of announcers came in second in Awful Announcing's Local TV Announcers rankings.